There are few things that can surpass the simple pleasure of opening packages…. 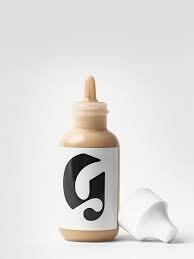 opening a Glossier package may be one of them. Who hasn’t been consumed by Glossier fever? I mean, even their adverts are covetably cool and chic. After months of pining I finally got my hands on the skin tint, and OMG am I glad I bought it. It’s everything I thought it would be and more. none of the effortlessly beautiful glossier models seem to have. My skin also suffers from a case of spots, and uneven tone, so despite being drunk on the Glossier Koolaid, I definitely had my reservations. But guess what! I needn’t have been worried at all. Here are my first impressions. I’m in love. Is it obvious? So first, lets address those millennial pink pouches. How cute are they? They’re perfect for carrying makeup on the go and I love that the packaging is meant to be repurposed! The tint comes in the classic minimalist chic packaging that Glossier is known for, and *cheap thrills*, but it definitely adds some Instagram beauty to my makeup cabinet. The shade I bought, dark, is not exactly my skin tone, but it is close. Doesn’t matter though because once this baby is smoothed on, (yes I said smoothed on WITH YOUR HANDS, no dirty brushes) it is imperceptible. It’s like an insta filter or yellow light from the setting sun…it just gives you a GLOW. Even though my scars are visible through the tint, they aren’t as obvious as they would be without the blurring glow. From a normal interpersonal distance, I just have youthful, plump, radiant skin. For someone who finds washing her hair time consuming, this tint is a lifesaver. It’s the only “I woke up like this” base that actually takes just as much time as waking up does. I’m going to put this tint through a few test runs before I issue my final verdict, but guys, GUYS. If you have oily skin or spotty skin and have been told that this will not work for you, disregard! You’re only a bottle away from Gigi level Glowy skin.